Cycling is about creating the perfect synergy between the rider and the bicycle. It’s about comfort, efficiency and safety. It’s about riding faster and further which can only be achieved by perfectly fitting your bike. Bike fitting is not just for the professionals! A bike fit will benefit anyone from the serious athlete to the casual rider and it’s available on all types of bikes. Bike fitting adapts the bike to fit your body and as everybody is different, so are their bike fits. We take into account many variables—flexibility, range of motion and riding style—to help you to achieve your optimum cycling position and improve your comfort, performance and also reduce the possibility of injury. The bike fitting is performed at our store in Nicosia, Cyprus and is provided free if you have purchased you bicycle from us. If you would like to book a bike fitting, please give us a call on 22 330470 to arrange the most convenient time. Evaluating the pattern of a rider’s dynamic impression on the saddle fitting tool is critical to identifying natural Pelvic Contact Condition and finding the correct saddle. 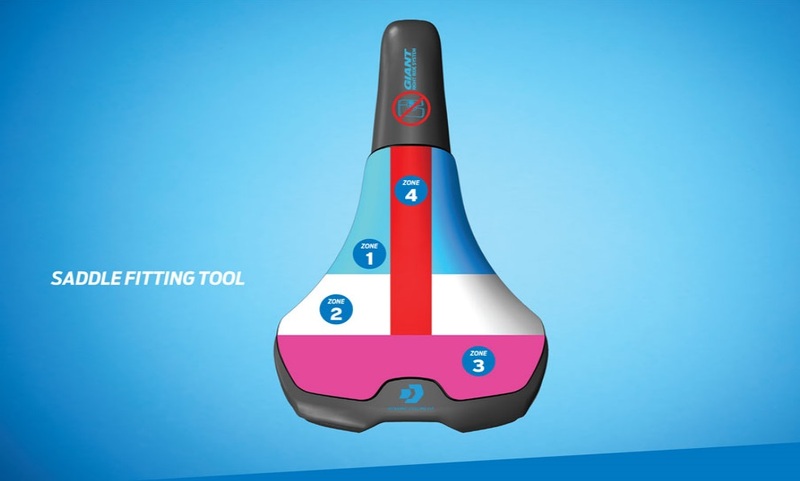 Our saddle selection process uses a special fitting tool to determine a rider’s pelvic contact condition. With the help of a Giant retail technician, it’s easy to find the perfect fit for optimized saddle comfort and performance!